Marilyn Monroe spent most of her short career playing a specific type of character. A darling of 1950s cinema, Monroe typically played showgirls, usually with varying amounts of gold-digging ditziness. Fairly early in her career, she briefly broke from type in her portrayal of Nell the unhinged baby-sitter in Don’t Bother to Knock. The film is a tense noir thriller. Interestingly, the movie reflects not only the stereotypical gendered problems of the 1950s, but at the same time features an accurate depiction of the societal conflicts of the time. 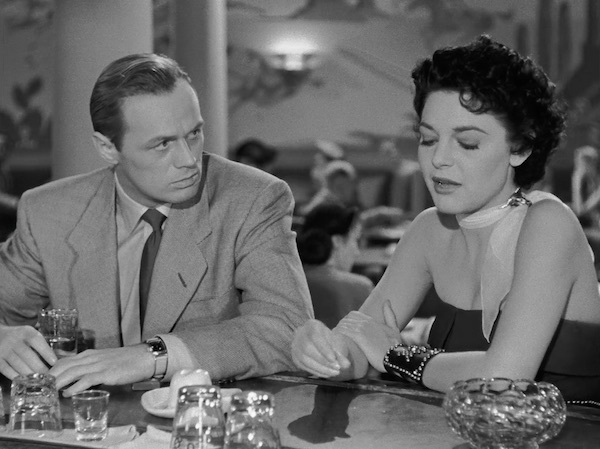 Don’t Bother to Knock follows Jed (Richard Widmark), a man spending the night at a small hotel in hopes of making peace with his ex-girlfriend, Lyn (Anne Bancroft). When his ideal reunion doesn’t happen, he drunkenly makes a move on a woman he sees in a near-by hotel room. However, he gets more than he bargained for with Nell (Monroe), a baby-sitter visiting the hotel on a job. As the film opens, the jittery Nell merely seems like a bit of an odd duck. However, as the story progresses, we learn her character’s traumatic past. Unfortunately, much of the story is told from Jed’s perspective. Not only does the story follow his point-of-view, but the camera often does as well. Early in the movie, Jed openly ogles an unknowing Nell across the courtyard. Totally unaware Jed is watching, Nell dances around the room. Meanwhile, the camera practically duplicates Jed’s perspective. This over-the-shoulder shot is as close as viewers can get to literally seeing the action through his eyes. The male gaze has come up in this column in the past. In fact, this is one of the most literal interpretations of the idea. Throughout the movie, Jed changes as often as the volatile Nell. As the action begins, he’s over aggressive and sleazy in his dealings with both women. Actor Richard Widmark made his film debut in 1947’s Kiss of Death, where he received critical acclaim for his portrayal of the sadistic Tommy Udo. Coming five years after his career making debut, Widmark found himself mired in this unlikable noir caricature. In this film, he seems caught somewhere between Tommy Udo and the romantic leads he transitioned to during the 1950s. While Jed and Lyn talk it becomes clear that he is clueless as to why their relationship failed. He initially believes she left him because he wouldn’t propose. This is 1952 after all. However, Lyn proves quickly him wrong. She wasn’t ready for marriage either. It turns out she was simply tired of him being a jerk. With his ego wounded, Jed stalks around the hotel. The aggression in his body language makes the sleazy character seem only one insult away from throwing one of the female characters down a set of stairs… as he’s done in previous films. However, the film’s narrative develops on a slow simmer. Thus, it takes a large chunk of Don’t Bother to Knock for the characters to get the development they desperately need. It turns out, Jed and Nell are both damaged by their circumstances. It eventually becomes clear that Nell’s pilot boyfriend died in a plane crash at the end of the war. Combine the trauma of loosing her boyfriend with the tension of a repressed family upbringing, Nell suffered a mental break. Throughout the film, she repeatedly references the sexual repression pushed on her by her parents. For her, even going with a boy to the “pictures” or for a “soda” was considered deviant. This is a common plot in drama throughout cinema of 1950s and 1960s. Interestingly, films like Splendor in the Grass, A Summer Place, and Marjorie Morningstar each feature young characters struggling under the effects of sexual repression. At the same time, Jed serves as a snapshot of wounded masculinity in the years following World War II. During his scenes with Nell, Jed briefly reflects on his time as a pilot during the war. On his return home, he found himself with no job and no prospects. With little other choice, he decides to keep doing what he did during the war and begins working as a pilot. As such, he seems trapped in this lifestyle; yet, he struggles with the societal norms that say he needs to get married and start a family. As Don’t Bother to Knock continues, Nell descends further and further into her insanity. However, Monroe largely carries the film with a powerful performance. It would be completely believable for the narrative to turn Nell into a villain… she does hogtie her 8 year old charge at one point. Yet, Monroe injects a wounded vulnerability into Nell, thus allowing the audience to sympathize with her character. This isn’t all her fault. As the film comes to an end, Jed gently hands the crumbling Nell to a police officer who is going to take her to a hospital. While the final credits scroll, Nell’s break-down seems to be all it took to make Lyn fall for Jed all over again. It seems the events brought out a new side of Jed. As Nell is led off, the couple smile at each other and giddily go off to get a drink. In her trauma, Nell has revitalized their relationship… typical. 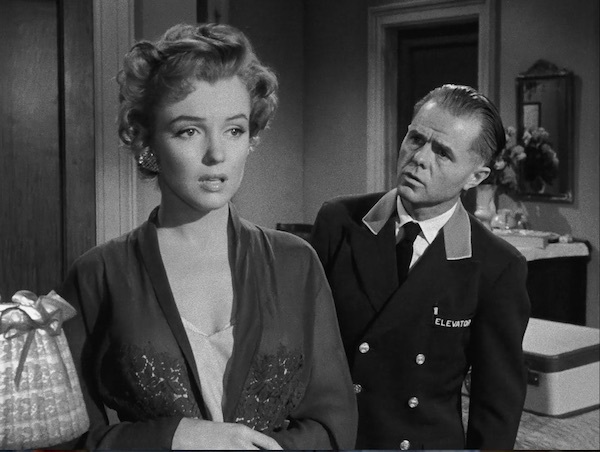 Don’t Bother to Knock features a relatively rare non-musical and dramatic performance from Marilyn Monroe. Surprisingly, it is Monroe’s performance which largely carries the film. Her wide-eyed vulnerability as Nell grounds the character in reality, and she’s completely believable as a woman damaged by her upbringing. The bulk of the film’s problems revolve around Jed as the male lead. While he receives some interesting and believable development in the third act, this hardly detracts from his sleazy, villainous portrayal through the first half of the film. However, the ultimate tragedy seems to be that only in Nell’s downfall, can Jed step above his flaws as a character.